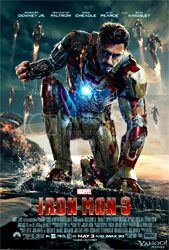 The underlying theme of Iron Man 3 seems to be “you create your own angels and demons.” Well, maybe “underlying” is not quite the right word. At the beginning, a voiceover from Tony Stark informs us that he created his own demons, and we see how Stark’s own callous behaviour in the years past have made him enemies instead of friends. Fortunately, there were no more obvious statements of that sort – it’s shown, instead of told. Stark made enemies, but he also made friends. And he made his iron suit. Stark saves the day in the end, not just because of his ingenuity but also because of his creations – his iron men, so to speak. From the opposite side, Aldrich Killian created his own downfall when he started down the Extremis path; further dooming himself when he lets spite and greed overtake him and he decides to use Pepper Potts as both bait and trophy. That said, despite the comparatively sombre theme and start, the film never feels dark or gloomy. RDJ really does do brilliantly as Tony Stark, and he manages to play the character as being troubled but not depressed. (Almost a sort of Jack Sparrow, in a way.) In this movie, we get to see more of Stark away from his iron suits and when he’s forced to think and act outside the protective armour, the man without his machinery proves that it’s not the suit alone that makes him a “superhero” – it’s his brilliant mind and resourcefulness that make him the hero he is. On that note, it has been reported that Avengers director Joss Whedon thinks the final battle of Iron Man 3 so amazing that he thinks he will have trouble topping it in Avengers 2. Er… I didn’t find the final battle so very fantastic. Yes, it features a small army of Iron Men suits flying around and Tony Stark swapping suits from time to time. The wonder of the final battle is that despite the numerous iron suits flying around, the focus was still firmly on Tony Stark rather than spending too much time on the flying suits. Apart from that, I didn’t quite comprehend why people have sung such praises of that final battle. It is a good fight scene, but nothing more. But the points that dissatisfy me with Iron Man 3 are minor. It is a fast-paced action film that does a couple of unexpected things (my favourite scene is the one where Pepper gets to put on the Iron Man suit – although I’d heard rumours she would get a shot at the suit, I didn’t expect it in the way it turned out), demonstrates RDJ’s strengths playing a character who has issues yet maintains his snippy and almost flippant persona, and shows us more of the mind of Tony Stark than the mechanical marvel of Iron Man. All in all, a pretty good superhero movie.